Accept are metal legends, but their story is not all that well-known, especially in North America. They are not a band you’d necessarily expect a book to be written about, but thankfully the prolific Martin Popoff decided to undertake the effort to do so. Metal Heart: Aiming High With Accept delves into the German band’s history from the very beginning. Many U.S. metalheads were first exposed to them via Headbangers Ball with their iconic song “Balls To The Wall,” but by then they had already released several albums. Like many of his other music bios, Popoff intertwines biographical information with song by song descriptions of each album. The result is an immersive experience made even more so if you listen to the albums as you’re reading the book. Revisiting Accept’s catalog was something I did while perusing it, and you’ll hear the songs and albums in a new way after reading the book and getting to know their back story. Accept have gone through a lot of struggles in their career, both from a lineup standpoint and on the business side of things. The book chronicles their beginnings through their ‘80s heydey to breakups to reunions to their modern era. Frontman Udo Dirkschneider left the band initially after 1986‘s Russian Roulette. That led to the short-lived David Reece era and his one album with the band, 1989‘s Eat The Heat. Udo returned to the band for a few years in the ‘90s, but left again to concentrate on his band U.D.O. After a hiatus of several years Accept reunited for a festival tour, but it was not permanent. A few years later the band brought aboard new vocalist Mark Tornillo, who has breathed new life into Accept. Even though Wolf Hoffmann and Peter Baltes are the only remaining members from the early days, Accept continue to record well-received albums and tour the globe. Udo has continued releasing albums with U.D.O., including a recent live effort of Accept songs. 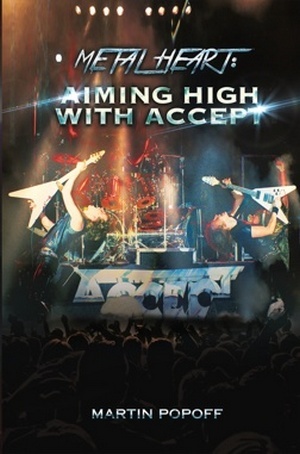 Popoff’s books are consistently well-written, researched and entertaining, and that’s the case with Metal Heart: Aiming High With Accept. It’s quick and fun read that sheds a lot of light on Accept’s story and music. You can order it at this location.